Mr Manu Lauria, chairman of board of Dkop Labs pvt ltd, Noida, delivered a lecture on “Code Optimization” on 21st March 2016 at JIMS, Rohini. 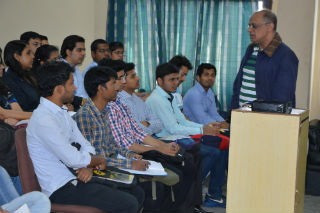 His interaction was with MCA 4th semester students who enthusiastically participated in this session and learned a lot from Mr Lauria who is an IIT-D alumnus and has over 30 years of experience in IT-industry. 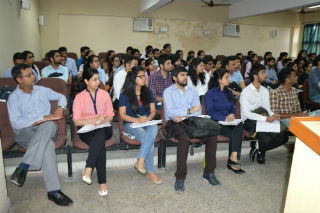 He advised students clearly define their priorities regarding placement in a service base company or product based company. His talk focused on improving coding ability of IT students and how to optimize a code so that it uses minimum number of computations and utilizes least resources. He used several complex programming examples like calculating factorials, prime numbers, NP completeness problems and travelling salesman problem to convey to students importance of code optimization. Students’ perception about subjects like theory of computations, analysis and design of algorithms, Graph theory, Discrete Mathematics etc. changed positively after attending this session. Mr Lauria emphasized on performance oriented approach in developing an algorithm and insisted that learning something new everyday is the only way to success. Mr Lauria also advised students to regularly read research papers on the areas of their choice and also to go through online open courseware offered of various top universities of the world including IITs from India.